Model 600PC has the same features as 600P. Pen is attached to base with a vinyl coil that extends to over 4 feet. Uses refills 746 or 744-10. Black only. Model 600PC. Same features as 600P. 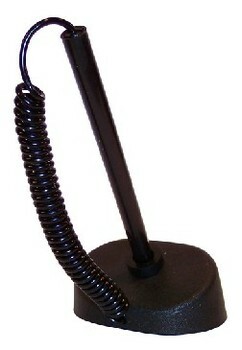 This security pen is attached to base with vinyl coil extending to over 4 feet. Black only.